I started playing the ‘cello when I was 8 years old in 1981. I wanted to play the guitar and told my folks as much. They suggested I play the ‘cello as it only had 4 strings and would be “easier”. I was very impressionable and so I began playing the ‘cello in the school orchestra with director Joseph Bynum. My god-mother Terri Benshoof was of great influence to me including being the owner of my first ‘cello and helped me along in the early years of my ‘cello playing. She gave me great support by recognizing early abilities. My teachers included Terri Benshoof, Walter Gray, and Robin Boomer. I played in numerous orchestras and ensembles. I played with all the orchestras and advanced orchestras all through my public schooling. I entered into contests for solo and ensemble playing, my most notable recognition was for a piece that I wrote in 1990 for ‘cello and viola called On a Completely Different Shore. I started playing publicly with string ensembles in 1989. Notable performances were at the St. Michelle winery in Kirkland, Washington, the Museum of Flight in Seattle, Washington and solo performances for Art openings most notably Kelly F. Kaczynski’s art opening of 1990. When I moved to Olympia Washington in 1992 to attend The Evergreen State College I found out about an Orchestra that was strictly playing contemporary music with the conductors own compositions as part of the repetoire. I joined the Olympia Chamber Orchestra with Conductor Timothy Brock in 1993. Under the direction of Timothy Brock the orchestra played and recorded his original scores for silent films Last Laugh and Berlin, Symphony of a Great City. In between Orchestras I found that playing for Artists, Authors, and Theater really resonated with me. I worked with Ericka Latta, David Russell, Tom Wisely, Christian Ryser, Michael Perrone, Naho Shioya and an Author who simply went by the name of 'D' along with others spanning across the country to New York. I really started incorporating the other instruments that I had cultivated such as the bass and percussion. My continued education in music was in performing and recording projects. 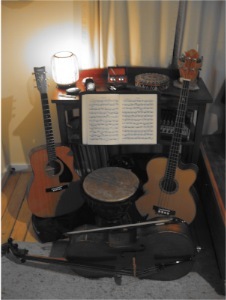 I have played in many ensambles and bands with varying music styles, from Classical, Folk, to Rock and Blues.